It has been an incredibly exciting week for me at Mitchell R. Grosky Photography. Early this week I received an email from VIDA. VIDA is a global partnership of creators–painters, illustrators, photographers, sculptors–pairing designers from around the world with makers in Pakistan and India in accordance with high ethical standards, to create original, beautiful products. And the best part is that using part of the proceeds from the sales of the products, VIDA creates literacy programs for the makers, so that they have opportunities to learn reading, writing and basic math that they would not otherwise have. The Artist Manager at VIDA indicated that she had seen my photography and digital painting online (at Mitchell R. Grosky Photography and Fine Art America) and believed that it would “fit beautifully with the VIDA brand and design vision.” In summary, they invited me to join their growing community of artists, which now includes a select group of illustrious multi-media artists from across the United States and around the world. Although I have never thought of myself in any way as a fashion designer, I was still intrigued by the idea of my artwork being used as the foundation for high fashion clothing. Naturally, I was flattered and excited to be invited to join a group of just 2000 artists worldwide in turning our work into high quality apparel like silk tops and accessories like modal scarves. However, when it comes to the Internet, I always like to do some careful research. I read some really informative articles about VIDA, a Google-backed company that works with a selective group of artists from around the world, transforming their 2D artwork into luxury fashion and apparel products. I saw some really positive media reviews on the Wall Street Journal, Women’s Wear Daily, TechCrunch, Fashionista, Fashion Times, and a few other magazines. What got me really enthusiastic, however, was the chance to really do some good in the world with a socially-conscious company–at the same time as my designs were made into apparel which people could wear with style, grace and pride. As I noted above, one of the best aspects of the program is that for every VIDA product sold, VIDA offers literacy programs–in reading, writing, and math–for the actual makers of the products, starting with the VIDA factories in Karachi, Pakistan. And so, over the last couple of days, I have searched though the nearly 100,000 photos residing on my computer in order to find some that I thought would look best on beautiful scarves and lovely silk tops. Now to be honest, my wife Anne, gave me some much needed advice, though my wife and daughter always tell me that I have a real knack for picking out beautiful clothes as gifts. There are now four products up on the site, and if I sell at least three pre-orders of any item, VIDA will make the products. The great news, at the time of writing this post, is one of my designs has already gone into production- the “Columbines in the Wild” design, based on a photograph which I captured of columbines on a path leading to the Quabbin Reservoir. There’s still time to purchase one of my first four designs. As mentioned, the “Columbines in the Wild” scarf is definitely going to be produced. With the other 3 designs, there is a time period of seven days to pre-order. I have to make a minimum of 3 pre-orders of each design for it to go into production. I’m really thrilled to offer this brand new collection to you! Please pop on over to my Mitchell R. Grosky ShopVida website to view the collection. As an incentive for new customers, Vida is offering 20 percent off your first order when you sign up. and use the coupon code VOICES to get 25% off (that’s just $30 for each scarf). As an added incentive VIDA ships absolutely FREE if you buy any TWO items or if you spend a total of $75 dollars. That makes these modal scarves and silk tops incredibly reasonable! Remember, pre-orders are only available for another 7 days. 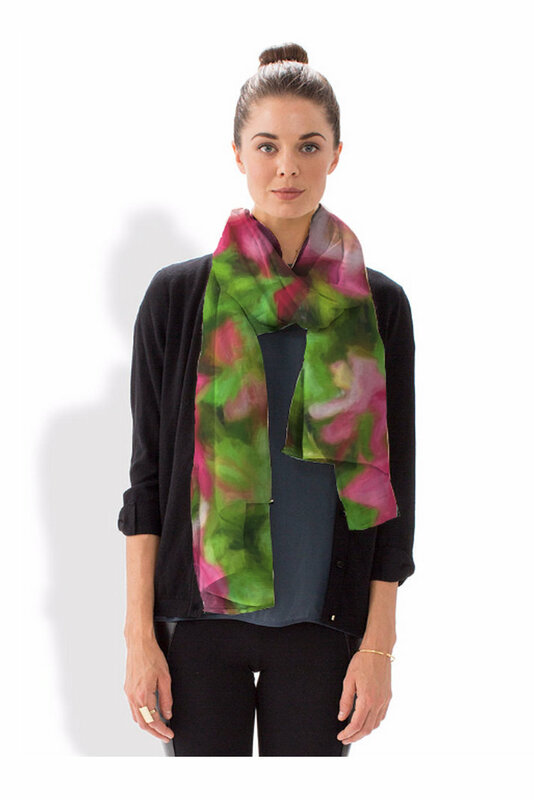 The beauty of wildflowers bordering the Quabbin Reservoir is the inspiration for this light and luxurious scarf. Featuring the photography and digital painting of Mitchell R. Grosky, this lovely scarf adds the perfect finishing touch to your wardrobe– glorious columbines lighting up this path leading to the Quabbin Reservoir in Central Massachusetts. This scarf is made out of 100% Micro­Modal® by Lenz­ing, a lux­u­ri­ously soft botanic silk fab­ric made out of Euro­pean beech­wood. Because of modal’s botanic ori­gin, it is par­tic­u­larly eco-friendly and its fine­ness is com­pa­ra­ble to that of nat­ural silk. Micro­Modal® offers a soft, beau­ti­ful sheen, with col­ors that are bright and vibrant. The com­pletely nat­ural fiber of this scarf is made in a fully inte­grated facil­ity in Aus­tria, opti­mized for pro­duc­tion syn­er­gies and energy con­ser­va­tion by using eco-friendly pro­duc­tion processes. The fab­ric is woven in a small fac­tory in Pak­istan. VIDA col­lab­o­rates with the owner and work­ers of this fac­tory to pro­duce the per­fect thread-count and weave for opti­mal soft­ness and sheen. AND …these scarves are huge! They are more like shawls. Because of the hand­made process, they range in size from 24.5” – 25” x 76” –77. Each piece is uniquely designed and custom-printed, and may vary slightly upon receipt. If pre-order goal(s) are met, item(s) will be shipped 30-60 days after the pre-order window closes, which may vary by product. Your credit card will be refunded the full amount for any product(s) that do not meet the pre-order goal. 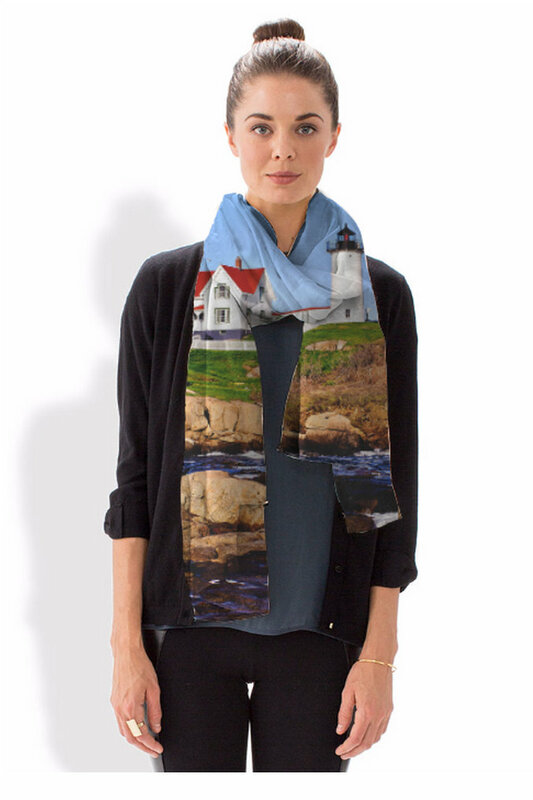 One of America’s most-beloved lighthouses is the inspiration for this beautiful scarf. 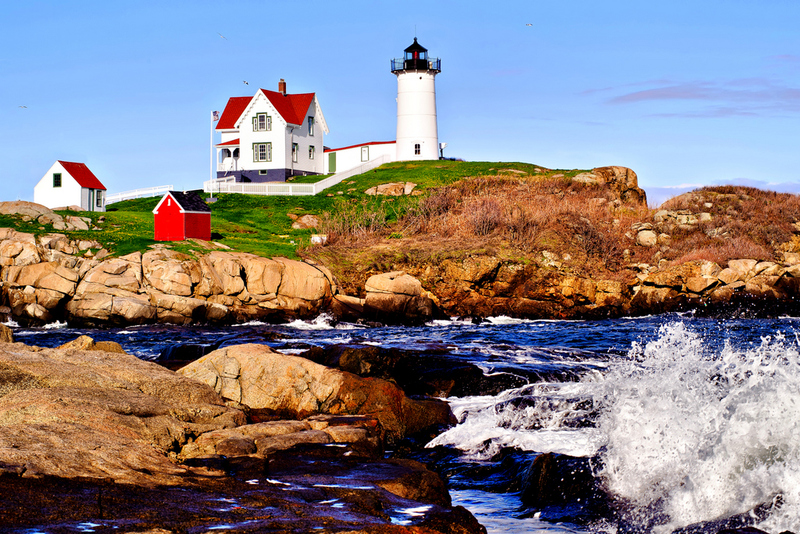 Featuring the photography of Mitchell R. Grosky, the scarf depicts waves crashing powerfully on craggy rocks just in front of York, Maine’s Nubble Light. Made with soft, luxurious fabric, this scarf will add a bold, modern statement to any wardrobe. 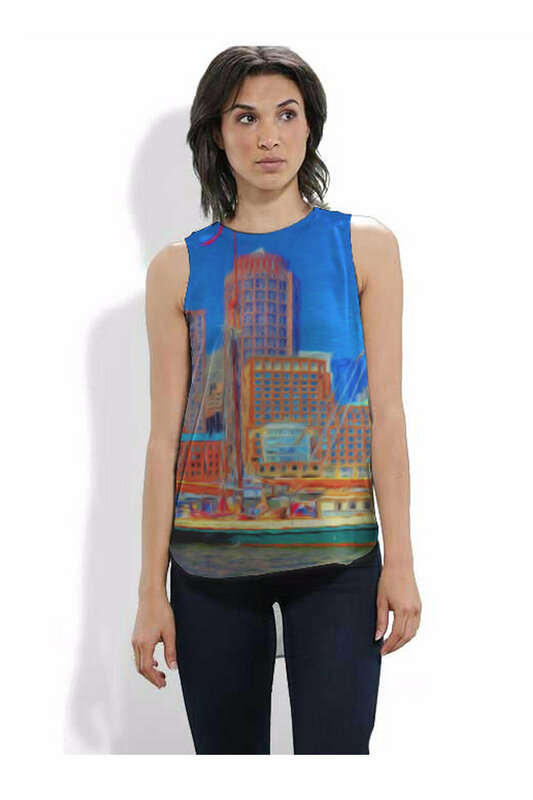 The magnificent, picturesque Boston Seaport is the inspiration for this lovely silk top. Cut with a flattering A-line and a rounded asymmetric hem, this silk top features the photography and digital painting of Mitchell R. Grosky. It strikingly showcases the natural beauty of the Boston Seaport along with the magnificence of the Boston skyline, and will make you look and feel effortlessly beautiful – day or night. Siz­ing Chart for the silk tops are as fol­lows. Note: tops fit true to size but a drapey cut — please size down if you pre­fer a snug fit. 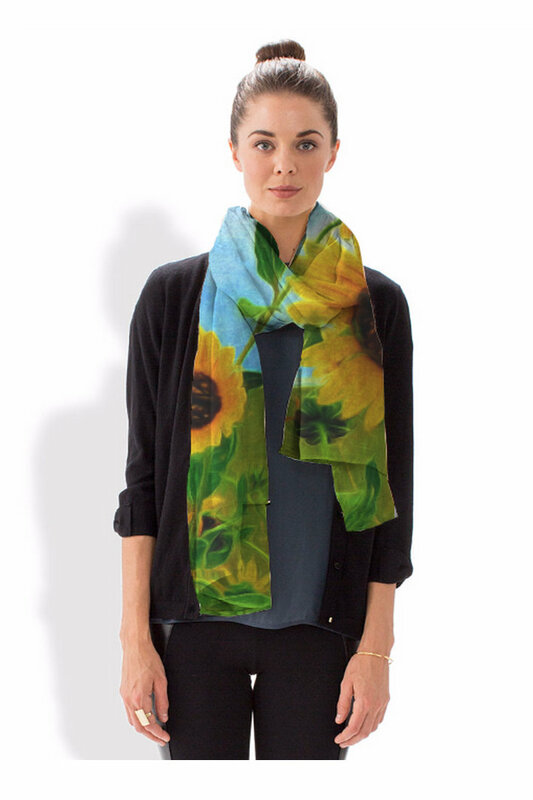 The vibrant beauty of sunflowers is the inspiration for this beautiful, luxurious scarf. 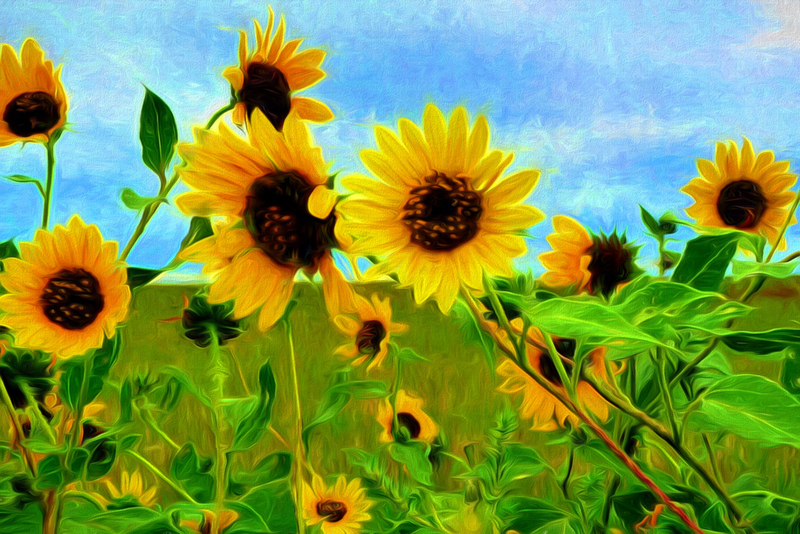 Featuring the paintography of Mitchell R. Grosky, this lovely scarf depicts the bright, vivid colors of a field of Kansas sunflowers, and would be a delightful accessory for any wardrobe. It is a privilege for me to introduce this lovely collection to you. Simply CLICK HERE to buy any one (or more!) of these scarves and lucious silk shirts, and don’t for­get to include coupon code VOICES to get 25% off (that’s just $30 for each of these lovely scarves–and $56.25 for a beautiful silk top! Please help me to spread the word by shar­ing this post with your friends and fam­ily through social media or in per­son. I really feel that these high fashion scarves and tops would make an absolutely gorgeous gift for a special person in your life. And when was the last time you bought something gorgeous just for yourself? You know you deserve it! Remember, the pre-order period expires just one week from today! 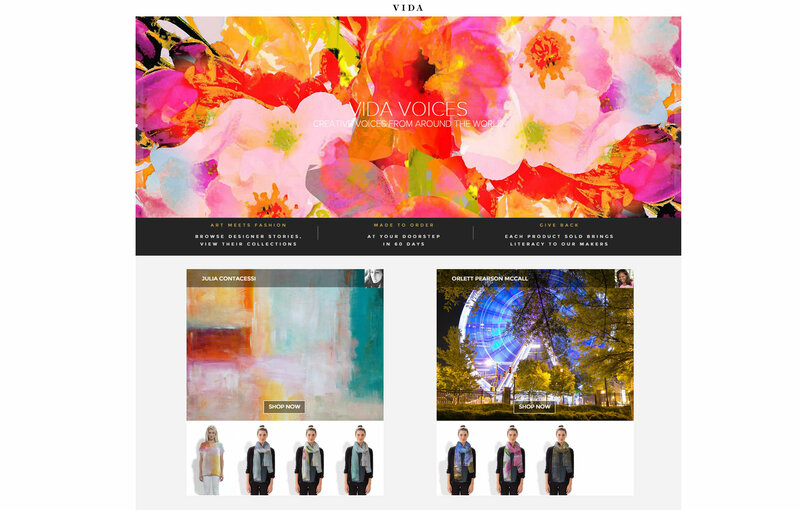 Please check out my new Vida Voices fashion line at shopvida.com.